Neighbourhood cultures, living costs and transit routes are important factors when looking for housing. UBC is served by 13 bus routes with connections to destinations throughout Metro Vancouver. All full-time students receive a reasonably priced TransLink U-Pass that provides unlimited travel on bus, SkyTrain and SeaBus. The cost of the pass is included in university fees. University Village is on-campus and consists of primarily one and two-bedroom apartments and townhomes. Many stores, restaurants and park spaces are within two minutes. Given the close location, rent is relatively more expensive than off-campus. Wesbrook Village is biking or walking distance from the centre of campus and serviced by many bus routes. There’s a large grocery store, retailers, restaurants and other shops within the village itself. Most apartments here are small and tend to be relatively more expensive because they are quite new and close to campus. Point Grey is the closest neighborhood to UBC—about 5-10 minutes by bus. There are plenty of restaurants and stores in the neighbourhood as well as a major grocery store. Buses run early in the morning and late at night to UBC and other neighbourhoods, including downtown Vancouver. Point Grey is near Vancouver’s iconic Spanish Banks Beach. There are many housing types available including basement suites, apartments, laneway houses and whole houses for groups of roommates. Point Grey is one of Vancouver’s most expensive neighbourhoods. Taking transit to campus can be frustrating. Buses are often full. “Kits” is one Vancouver’s most trendy neighbourhoods. There are many grocery stores in the area, restaurants, and a vibrant nightlife. During warmer months, Kitsilano Beach and Jerico Beach are popular with residents and tourists. Kitsilano is highly desirable, which means finding housing can be difficult and rent is high. Bus service starts early and ends late. An average trip to UBC is about 20 minutes. Groups of roommates often find Dunbar is a good option. Rent for an entire home here tends to be more affordable for students. There are several grocery stores and a trendy commercial area with retail shops and restaurants. Dunbar is quiet and more spread out than Kitsilano, which means housing is sometimes further from a major bus route. Buses to Dunar do not usually run late at night. These neighbourhoods are served by several bus routes and are closer to downtown Vancouver than Dunbar. There are many single family homes, restaurants, and grocery stores. Transit is less frequent here because it is a family-oriented area of Vancouver where most people drive vehicles. Kerrisdale is a slightly longer commute by transit to UBC than Arbutus Ridge. This is the core of Vancouver—home to vibrant beaches, trails in Vancouver’s iconic Stanley Park, restaurants, nightlife and diverse lifestyles. 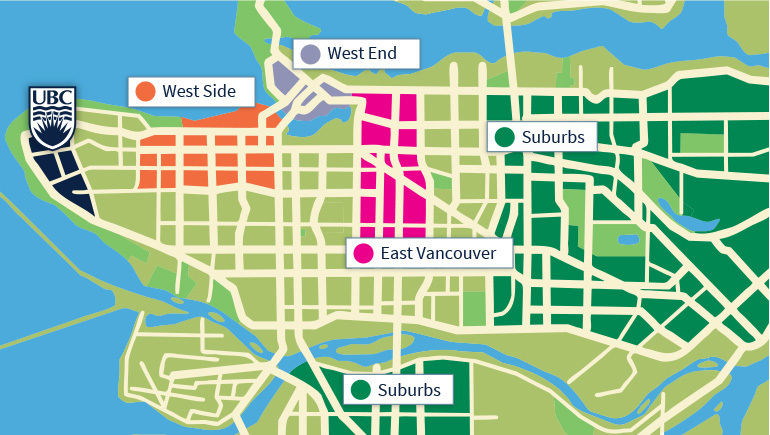 Neighbourhoods include Yaletown, Gastown, and The West End. An average trip to UBC by bus is 30-45 minutes. Downtown rent is expensive and living spaces can be small. East Vancouver is a popular choice for students because of its unique, affordable neighborhoods: Chinatown, Main Street, Commercial Drive and Mount Pleasant. “East Van” is usually less expensive than neighbourhoods closer to UBC. The commute by bus can average 45-60 minutes and are very busy morning, afternoon, and night. There are many affordable cities surrounding Vancouver, including Burnaby, Richmond and New Westminster. Many UBC students who have families in these areas commute to UBC to save money. By car or transit, the trip can take an hour or longer. When looking for a place to live, think about what is most important to you. Transit: Most UBC students who live off-campus take transit every day. Is it walking distance to regular transit? Living far away from the bus stop can add many minutes to your commute. Will you need to take more than one bus? Bus transferring adds time to your commute and can be frustrating if you miss a connection. How frequent and busy are the buses? Buses close to campus are usually very full and sometimes too full to stop for more passengers. Is cheaper rent worth a longer commute? Try picturing yourself after a long, exhausting day. Noise and neighbourhood dynamic: No one deserves to have an uncomfortable living situation. Are you okay with noise from other students, young families with children, or busy traffic? Do you think your new neighbours will be okay with noise coming from your place? Weather: Vancouver is warm in the summer but tends to be rainy, cloudy and cold in the winter/fall/spring. Do you mind biking or walking to campus or other places around Vancouver during inclement weather? Is it worth more expensive rent to live within minutes of all the amenities? Food sources: Something you will need to think about almost every day. Do you prefer cooking or eating out? Do you have easy access to a car or transit to get to the grocery store? Utilities: Heat, Internet, and cable. Can you control your own thermostat? Does Internet quality matter to you? Laundry: How will you wash your clothes and how often? Most apartment buildings have shared laundry rooms with coin-operated machines. Basement suites and houses may or may not have a washer/dryer. Where is the closest laundromat? How much furniture will you need? How will you get new furniture into the place? Do you need a truck rental? Furnished apartments often make sense for students looking for short-term housing. Sublets: If you need to, discuss it with your landlord. Housing styles: What’s the difference? Lots of noise from above, especially if children live upstairs. Few windows or natural light sources. Sometimes small with low ceilings. Is there a yard and who is responsible for upkeep? Rents vary greatly depending on apartment location, age and condition. For example, it is generally more expensive to rent in a condominium building than an apartment building, and locations close to UBC are typically more expensive than elsewhere in Greater Vancouver. Keep in mind, these are only general guidelines for cost. Rental averages from CMHC Urban Rental Market Survey Data, October 2017. Before you begin your search, make sure you know what kind of place you’d like to rent and how to avoid scams. There are many ways to search for an apartment in Vancouver—from websites to notice boards. Make sure that you’re getting all you were promised. Before signing a lease, inspect the unit (or have someone you trust inspect it for you). Do the appliances work? Check inside the fridge and turn on the stove. How loud is traffic noise when the windows are open? Are there locks on all doors? Do the shower and taps work? Turn each one on. Do the walls require new paint? If so, ask the landlord to paint before you move in. Is the carpet clean? Ask the landlord if the carpet will be cleaned before you move in. Will you have to pay extra for heat, electricity, cable, laundry facilities, storage, or parking? Can you paint the walls? Are you allowed to hang things on the walls? Water damage (yellow stains on the walls and ceiling), mouse droppings, and cockroaches are very bad signs. Avoid renting suites that have these problems. Be sure to alert your landlord to these issues if they come up after you move in. Get details of your rental agreement in writing. Take photos to document any existing damage or repairs needed before you move in. If the landlord says something will be repaired or cleaned before you move in, write this down in the agreement. Make sure both you and your landlord have a copy of all the agreements you have signed. If you make any changes to the documents, both you and your landlord should initial next to each change. Prove that you paid. Pay by cheque or money order, or get a receipt if you pay in cash. Most tenants need to contact BC Hydro to set up electricity and a communications company for TV, phone, and Internet service. TV, Internet, home phone, mobile phone options: Shaw, Telus, Bell, Rogers or Novus. We advise that you insure your belongings against theft, fire, and other damage. You may choose to insure your belongings with any private insurance company or BCAA. Review information on renting in Canada, leases, tenants’ rights, and dealing with landlords. A few options while you search for a place.